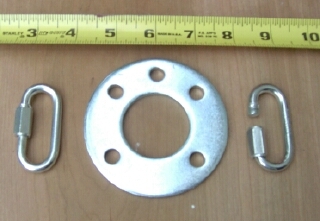 Guy Rings for the aluminum or fiberglass mast sections: Each guy ring is laser-cut to our specifications and is 3.5 inch OD, 1.6 inch ID, and 0.125 inch thick aluminum. We now provide them painted olive drab to match the mast sections, or natural aluminum. This is strong high-quality 6061-T6 aluminum. They easily fit over the male end of the mast sections, and will allow the mast to be rotated. Note that these only fit at the mast section joints. There are five 3/8-inch diameter holes for use with 3 or 4 guy line configurations. Price is $7.00 each, or 3 for $20.00, when ordered with a box of mast sections. We recommend the use of Quick-links, Snap-links, or some form of metal hook assembly, for attaching the guy lines to the rings. These allow for quick and easy attachment of the guy lines. We make this recommendation because the edges of the holes in the guy ring can cut/fray guy lines. The Quick-links offer a nice smooth surface to tie/wrap guy lines. We are offering 3/16-inch Quick-links, rated for 660 lbs, and priced at $1.25 each when ordered with guy rings. Note that the pictures show the guy rings with their natural zinc plating before we paint them. We do not paint the Quick-links. This heavy-duty base assembly (used in our Vertical Antenna Kit) is made from two pieces of composite material (high density polyethylene and wood flour) fastened with long lasting stainless steel hardware and includes a heavy duty zinc-plated steel U-shaped pivot piece. Overall length is 11 inches and width is 5.5 inches. A short length (7-inches) of aluminum mast section is included for easy connection to your mast sections. A 3/8-inch diameter zinc-plated steel hinge pin is included to fit the pivot piece. In addition, 4 galvanized 12-inch long ground stakes are included for use when setting the base assembly directly on the ground. The larger section of composite material has 6 drilled holes that will accept the ground stakes, or you can use 3/8 inch bolts (not included) to attach to other surfaces (fence posts, tree trunks, concrete pads, deck floors, etc.). Depending on your total height and top load (antenna, mount, pulley, etc. ), you can then easily walk up the mast. 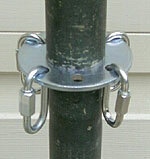 The Base Assemby will work with either the standard or ribbed-sided aluminum sections. The pivot piece does not lock into a vertical position; therefore, guying is required to maintain the mast in a vertical position. In addition to the above insulator, we have acquired some of the Kwik Block KB-5400 mounting block/insulators (reference http://www.kwikblock.com). 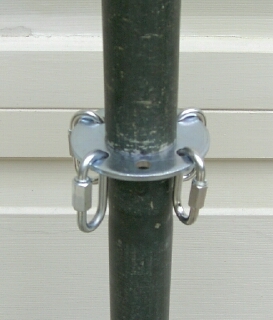 Two of these can be used as insulators to mount on a 6X6 inch vertical post; then use stainless steel hose clamps to attach the aluminum mast tubes. They can also be use as insulated boom mounts for yagi elements. Price is $5.00 each, plus box & shipping. 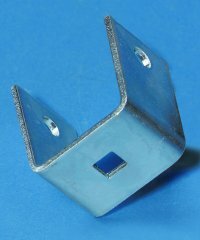 Zinc-plated steel "square-U" ( |_| ) piece suitable for using as a pivoting base. Piece is 2.25 inches long, 1.5 inches wide with an inside spacing just right for a snug fit on the female end of the aluminum mast tube. There is a matching 3/8 inch round hole in the top of each leg, and a 3/8 inch square hole in the bottom. The steel material is 5/32 inch thick. Price is $6.00 each, plus box & shipping.